Visit any local market on a cruise through Portugal’s beautiful Douro valley and you may find yourself doing a double take. Some of the produce is easily recognisable, not least colourful mounds of temptingly fresh vegetables and fruits, but other specialities take some identifying. You’ll see stalls piled high with bacalhau, for example, or salt cod, essentially the country’s national dish. Cod is preserved in locally harvested salt and then rehydrated before cooking. Bacalhau is cooked in dozens of different ways and every household has its favourite. One of the most popular is bacalhau à bras, salt cod boiled up in a stew with garlic, onions and olives, with fresh parsley and a scrambled egg stirred through to create a comforting dish. You’ll spot this, or variation on its theme, on many restaurant menus. Other local gems include the peculiar-looking percebes, or goose barnacles, which grow on rocks along the waterline all the way from Galicia in northern Spain down to Portugal. They’re incredibly difficult and dangerous to harvest and as such, command a high price in the market. People say they’re delicious but some may find their appearance unappetizing! Another acquired taste is tripas, or tripe stew, made of tripe, onions, beans and spicy sausage. A lot of northern Portuguese culinary tradition stems from times when most people were rural dwellers and relatively poor, hence the tendency to use every part of an animal. You won’t see quite such rustic cuisine on the ship but the menu on both MS Douro Elegance and MS Douro Splendour does include many of the finest local dishes, from delicious fish stews, using local produce from the Atlantic, to sausages, veal with a port wine sauce and pork loin with chestnuts and bacon. So what’s good to try on a Douro voyage? Here are some of our favourites – delicacies you’ll find either on board your river cruiser or in shops, cafes and markets along the way. 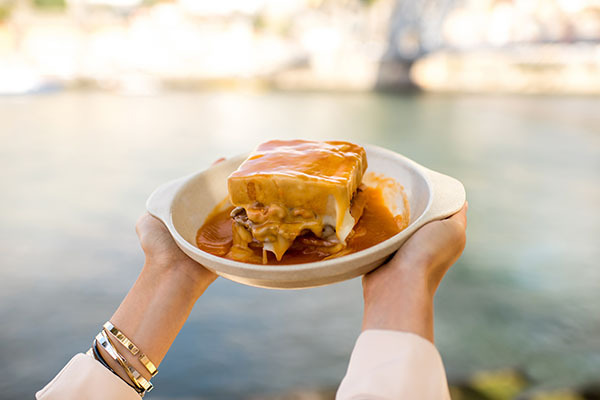 One local gem that does find its way on board is Porto’s signature sandwich, the lunch buffet will include a relatively dainty, toned down version but the full francesinha is a vast tower comprising layers of ham, steak, chicken and chorizo between bread smothered in melted cheese and then covered by a sauce made of beer and spicy tomatoes. Simply watching someone tuck into one of these beasts in a café is entertaining. 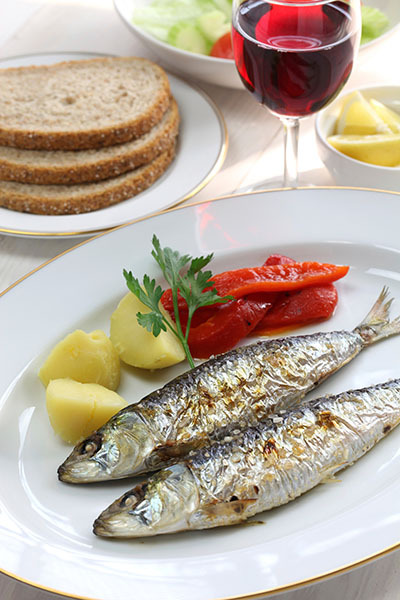 Sardinhas assadas is a simple dish: Fresh sardines, caught that morning in the Atlantic, grilled or fried with garlic, olive oil and lemon juice. If you’re spending a day in Porto before your cruise, try these for lunch at a riverside restaurant. Washed down with a crisp, chilled vinho verde, this is the taste of summer. 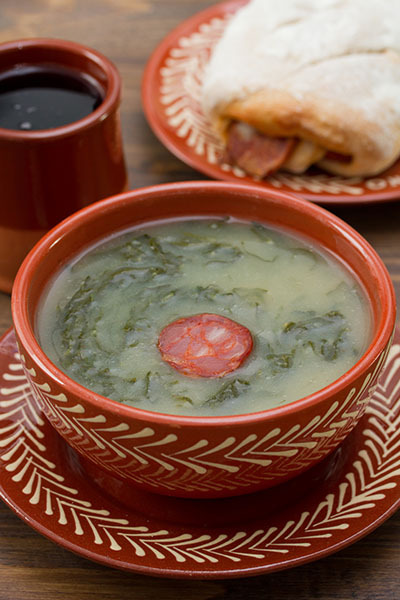 Caldo verde is a delicious, salty soup of kale and potatoes with spicy sausage or other kinds of meat thrown in. The soup is thickened with pureed potatoes and flavoured with a generous spoonful of garlic. You’ll see it in markets, being tended and stirred in great vats, with locals stopping to enjoy the soup in their lunch breaks. Frango na Púcara is a heartier dish of slow-cooked chicken, on the bone, backed in a heavy pot in the oven with tomatoes, mushrooms, onions and chorizo, with a hefty slug of port, brandy and white wine thrown in for the final phase. A lot of Portuguese cuisine involves cooking with wine, which is what makes it so delicious. Every town along the Douro has its specialities, so when you’re in Lamego, included on every Douro voyage, take time to sit in a café and sample the local wares. These include presunto, an air-dried ham, as well as bola de Lamego, a savoury pastry filled with either ham or sardines. You’ll see the local sparkling wine, Raposeira, in the shops here, too. The Portuguese have a sweet tooth and one thing you’ll find everywhere, including on board, are the more-ish pastéis de nata. 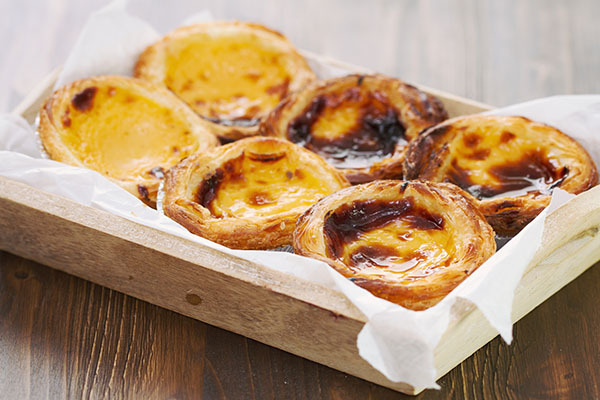 These dainty little tarts are made from layers of flaky pastry, baked with custard that’s infused with cinnamon, with more sugar and cinnamon dusted on top to give a very thin, caramelised crunch. There will be a demonstration of how to make them on board your ship, too. You’ll also have a chance to try the sublime Portuguese almond cake, toucinho do ceu, which is served on board, as is quindim, a dessert made with eggs, sugar and coconut. Of course, one of the reasons you have chosen a Douro cruise is probably to try the wines for which the region is famous. Deep into the Douro valley, generations-old port houses have their vineyards, in immaculate rows across the contours of the steep hillsides, guarded by expensive-looking country mansions. There will be multiple opportunities to sample port and if you haven’t visited the region before, you will probably be amazed at the many different varieties. Pink port with tonic over ice, for example, makes a wonderfully refreshing summer drink, while white port, again, with tonic, is drier than the red wines and is often served chilled, as an aperitif. Wines, too, are delicious, from the pale, fruity, slightly fizzy vinho verde to the famous Mateus Rosé; a visit to the elaborate Mateus Palace and its beautiful formal gardens is featured on your Douro itinerary, with a chance to taste some of the famous wine. Fortunately, the grower has modified this over the years to satisfy changing tastes and it’s no longer quite so sweet and fizzy. If you prefer red, there are some robust wines from the Douro valley that you’ll want to try, made with grapes like the touriga franca, which produces a fruity wine that mellows deliciously with age, or tinta roriz, also fruity. As well as the vineyards, you’ll see groves of silvery olive trees and regimented rows of almond trees. The produce of both of these is widely available, from green extra-virgin olive oil to almond liqueurs – something memorable to take home. 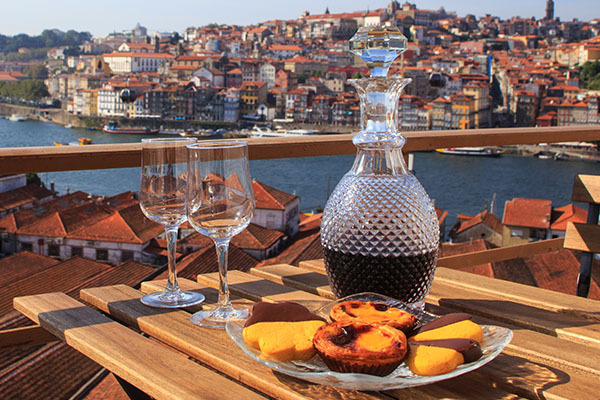 If you’re interested in sampling the culinary delights of Porto and the Douro Valley, click here to view tours and river cruises to Portugal. 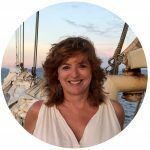 Sue Bryant is an award-winning journalist specialising in (and addicted to) cruising. She is cruise editor of The Sunday Times and also contributes to magazines and websites worldwide, including Sunday Times Travel Magazine, World of Cruising, Cruise Passenger (Australia), Porthole (USA) and www.cruisecritic.co.uk. Sue lives in London but is often travelling, exploring the world’s rivers and oceans. She has sailed on more than 100 ships over the last 15 years.